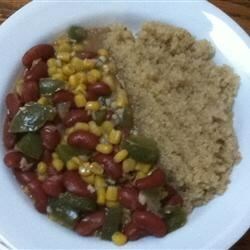 "Kidney beans, corn, and red onion combine for a delicious dish that works well with rice or quinoa. This could also be served as a very hearty soup or chili." Heat the olive oil in a skillet over medium-high heat, and cook garlic and onion until onion is tender. Stir in the green bell pepper, and cook until tender but firm. Season with cumin, mustard, cayenne pepper, salt, and black pepper. Stir the kidney beans with liquid and corn with liquid into the skillet. Bring to a boil, reduce heat to medium, and continue cooking 20 minutes, stirring occasionally. Serve immediately. The kick of herbs and spices gives this chili amazing flavor, with less fat. Absolutely horrible! My husband and I took one bite each and threw it out. You could only taste spices, nothing else. My grandma used to make a dish like this. She used creamed corn and kidney beans. We called it "kali ca mash" She sered it with bacon and we had a meal. Those were the days.